What Games Can the Nvidia Shield Play? Nvidia’s previous entry in the tablet market was the highly-rated Nvidia Shield Tablet. It cornered the Android Gaming Tablet market with its mix of exclusive content (Half Life 2) and ability to stream from a PC. Not only was it a great tablet for gamers, it was a top tablet in its own right, offering good specs (for the price) with no bloatware. In time for Christmas comes this updated version – named the Nvidia Shield K-1. So how good is it, and how does it compare to previous model? The short version? It’s pretty much the same, which nevertheless makes it the best tablet for gaming on the market. Little has changed in terms of the device’s exterior. The tablet has a chunky, solid case around its 8-inch screen. The rear casing is soft and quite comfortable to hold. Where once there was a slot to house a stylus, now the hole is gone and you have to buy the stylus separately. Not much pain there – it was a strange inclusion in the first place. Stranger, but just as understandable, is the decision to cut costs by not including a charger. That’s right – there’s no charger included! Their reasoning is that most people already have two or three micro-USB chargers lying around their homes, and they’d rather cut costs here than on the tablet itself. Makes complete sense to me, but for the 2% of customers who take this home and realise they have NO WAY TO CHARGE IT! there will be hell to pay. Overall, the design is essentially identical to the older model. The screen has 283 pixel per inch spread over a 1920 x 1200 resolution. The screen isn’t outstanding, but it’s pretty good, with good viewing angles and nice color definition. All ports (stereo speakers, micro SD, etc) are ‘as you were’. Minor changes include a rear-side logo and refreshed texturing on the sides – if you didn’t know what to look for you could easily confuse the two models. It measures 221x126x9.2 mm and weighs 390 grams. The processor is a 2.2GHz quad-core Tegra K1 – Nvidia’s powerful X1 CPU seems to have been too expensive – backed up by 2GB of RAM. In fairness, the K1 can cope with most games. Internal storage is 16GB, which can be greatly increased with a micro SD card. The battery’s capacity is 5,200 mAh but this won’t last too long when putting the K1 through its paces – battery life is a disappointing 3 to 5 hours of intense gaming or 7/8 of normal tablet use. Both front and rear cameras are 5MP, while there’s a micro-USB port, HDMI-out, and support for WiFi, Bluetooth, and GPS. The K1 comes with Android 5.1.1. but an upgrade to 6.0 Marshmallow should be available sooner rather than later. Nvidia haven’t done much messing about with the base Android, so there’s no bloatware (unwanted software). There is a lot of game-related support software, such as the ability to connect external controllers. The Shield Store offers exclusive gaming content that can only be played on Nvidia’s Tegra devices. Streaming to a TV is easy, and there’s access to a cloud-based gaming service called GeForce Now. This is free for 3 months and the games available are surprisingly new. Recording gameplay is a cinch, and broadcasting via Twitch is the work of a few button presses. Performance is very, very solid. Action games run smoothly with no lag and it is said the K1 will be able to play Doom 3. Benchmarks put it way ahead of the iPad Air 2 and are similar to those of the (much more expensive) iPhone 6S. Framerates are generally superb even on new games such as Star Wars Battlefront. Nvidia claim it is 2.5 times faster than the Samsung Galaxy Tab S2 8″. There are more than 200 with official support and optimisation. The official Nvidia website has good info about that. Here’s the link. It’s not that much better than the previous model, but is 100 dollars cheaper. Since the last one was already well ahead of the curve, the new model crushes its closest competitors and even stands up against much more expensive devices. Make sure you have a micro-USB charger and consider if you want a game controller, stylus or other accessories when thinking about the price. 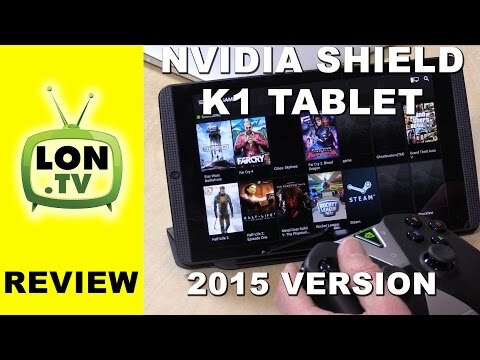 Gamers will love the Nvidia Shield K1 tablet. The tablet plus a controller is a genuinely attractive option and won’t break the bank.